Almost everyone knows the name and the product, but not as many know the history of Harley-Davidson, a company that started with just four men and a bevy of American spirit. Stocked with archival images and full-color photographs, Classic Harley-Davidson provides a comprehensive history of America’s favorite motorcycle. Every era is featured, from 1903’s motorized bicycleAlmost everyone knows the name and the product, but not as many know the history of Harley-Davidson, a company that started with just four men and a bevy of American spirit. Stocked with archival images and full-color photographs, Classic Harley-Davidson provides a comprehensive history of America’s favorite motorcycle. Every era is featured, from 1903’s motorized bicycle to the roadburners we know and love today. 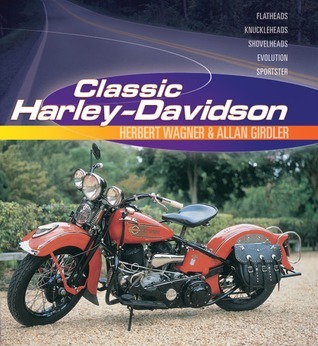 Combines Wagner’s Classic Harley-Davidson 1903-1941 and Girdler’s Harley Davidson Motorcycles from MBI's best-selling paperback Enthusiast Color Series into one value-priced hardcover book that makes a great gift and introduction to this legendary company and motorcycle.